The annual Aerospace Media Awards dinner was held this year at the Aéro Club de France on June 18, the eve of the Paris Air Show. NPC Broadcast/Podcast Team member Adam Konowe, head of the judging panel, was at the event, which was founded by industry veteran Peter Bradfield. 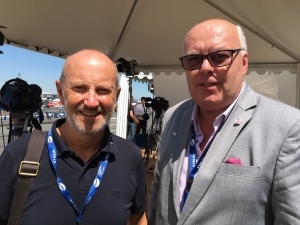 The following day, Konowe interviewed Bradfield and his celebrity host, Scottish comedian Fred MacAulay, in the Paris Air Show media center. Topics included how the awards are judged, sponsored and perceived, as well as the potential for future expansion including an all-new defense-related media awards event in 2018 to be held in Washington, D.C.